As the world continues to reel under the pressure of its fast disappearing green patches, India is setting a new trend. In a mere span of two years, the country has managed to increase its forest and tree cover by a whopping 8,021 sq km; the India State Forest Report 2017 released on Monday by the Environment Ministry revealed. >>The 15th report in the series of biennial reports that officially records India’s forest and tree cover, it mentions that over 24.39% of the country’s geographical area now constitutes of green cover. >>Recorded using satellite data and followed up by ‘ground truthing,’ the total forest cover is estimated to be 7,08,273 sq km (21.54% of the country’s geographical area), and the total tree cover is estimated to be 93,815 sq km, (2.85%). >>The Environment ministry attributed this rise in the green cover to the success of multiple afforestation programmes. India now ranks 10th in the world for forest area and eighth for annual forest gain. >>A detailed breakdown of the numbers reveals that states like Andhra Pradesh, Karnataka, Kerala, Odisha and Telangana have contributed to the maximum increase in green cover. But unfortunately, six northeastern states including Mizoram, Nagaland, Arunachal Pradesh, Tripura, Meghalaya and Sikkim have seen a steep loss of green cover estimated at 630 sq km. 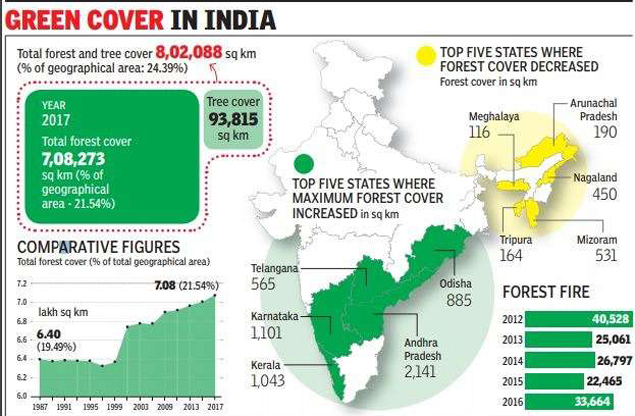 >>The three states that have recorded the maximum increase in forest cover include Andhra Pradesh with 2141 sq km, followed by Karnataka with 1101 sq km and Kerala with 1043 sq km. >>If one were to take into account the overall forest cover in the country, Madhya Pradesh records the largest forest cover regarding area at 77,414 sq km, followed by Arunachal Pradesh at 66,964 sq km and Chhattisgarh at 55,547 sq km. >>With regards to the percentage of forest cover in comparison to the total geographical area, Lakshadweep has the highest forest cover with 90.33%, followed by Mizoram at 86.27% and Andaman & Nicobar Island with 81.73%. >>The forest cover for assessment is divided into three categories based on its density into ‘very dense’, ‘moderately dense’ and ‘open’ forest. >>Also, the loss of 630 sq km of pristine forests in the eastern Himalayas isn’t a good sign, say experts. The maximum forest cover reduction in the north-eastern states is recorded at Mizoram (531 sq km) followed by Nagaland (450 sq km) and Arunachal Pradesh (190 sq km). Although data are showing significant increase of total green cover in INdia. But the govrnment and people as well will have to ponder over why the good forest is not showing any increase. A separate survey should have to be organised to assess the condition of good forest and causes of its decrement.